There are times when you have a close call and you walk away from the moment grateful that it is over, but the important take away from those experiences is did you learn something? Over the years we have had a few issues with our animals and their collars. 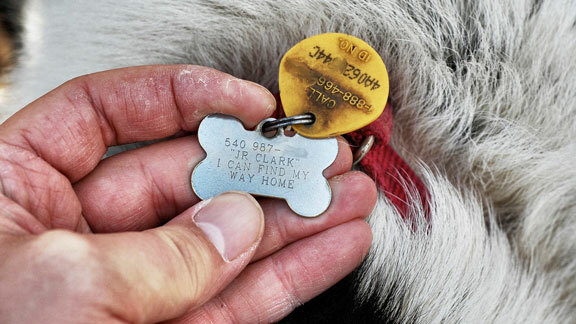 Having our dog and cat wear a band around their necks with a name tag and license is important as the unexpected can happen and we can get separated from the ones we love. And yet those sometimes stylish adornments can be dangerous. I have a funny little story that when I look back at it, is hysterical, but was very scary at the time. Our dog Nishka, a beautiful Siberian Husky, had gone out in the yard in the early hours of the morning to do her business. My spouse used to sleep in the buff and had gone downstairs to let her out and was waiting off to the side of our slider for her to reappear. Nishka meandered up the back steps and laid down on the deck and began to scratch her face, I was standing in the upstairs window watching her, thinking how sweet she looked when I realized she was struggling. I yelled down to my spouse and as he looked out he realized her tags had gone between the cracks of the two by fours of the deck and had twisted. She was stuck! Confused why she couldn’t get up she began to panic and jerk trying to free herself, she was in trouble. My spouse knew there wasn’t time to head upstairs to get a robe, in his birthday suit he whisked out onto the deck and managed to get her buckle undone on her collar, freeing her. It was a comical sight and I am sure there were a couple neighbours behind us that got an eyeful. We have had the cat’s collar get stuck in the bathroom vent more than once and had to extricate him, Lucas has had his tags get caught on the back deck in the house here and just recently I had a new incidence that was scary. Lucas wears a pinch collar, he only ever has it on while walking, but he needs it to remind him not to drag me down the street behind him. We were walking along a path way that has a chain link fence and Lucy one of the neighbourhood dogs is often on the either side eager to say hello. Lucas was so excited that he may see her that he began rubbing himself along the fence and somehow his prong got connected to one of the links in the fence and he was caught. His first instinct was to pull back , it tightened and he went straight into panic mode. Thankfully I was able to somehow keep a hold of Diesel and extricate Lucas, but had I not been with him, I worry what the outcome would have been. Sometimes the thing that seems so innocuous and there to keep our pet safe, can also put them in danger. If it is possible, take your pets collar off when they are in the house and especially if they are in the crate!